The sensation of pain in hell is essentially very dreadful. Picture yourself, my soul, on a dark night on the summit of a high mountain. Beneath you is a deep valley, and the earth opens so that with your gaze you can see hell in the cavity of it. Picture it as a prison situated in the centre of the earth, many leagues down, all full of fire, hemmed in so impenetrably that for all eternity not even the smoke can escape. In this prison the damned are packed so tightly one on the other like bricks in a kiln...Consider the quality of the fire in which they burn. First, the fire is all-extensive and tortures the whole body and whole soul. 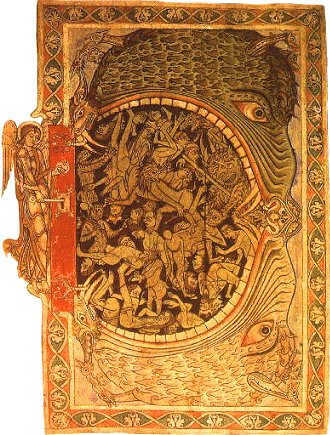 A damned person lies in hell forever in the same spot which he was assigned by divine justice, without being able to move, as a prisoner in stocks. * A most terrible thing about hell is its duration. The condemned person loses God and loses Him for all eternity. Secondly, this fire is far more dreadful than man can imagine. The natural fire that we see during this life has great power to burn and torment. Yet this is not even a shadow of the fire of hell. There are two reasons why the fire is more dreadful beyond all comparison than the fire of this life. The second reason is the malice of sin. As God knows that the fire of this world is not enough to punish sin as it deserves, He has given the fire of hell a power so strong that it can never be comprehended by any human mind. - Now how powerfully does this fire burn? It burns so powerfully, O my soul that, according to the ascetical masters, if a mere spark of it fell on a millstone, it would reduce it in a moment to powder. If it fell on a ball of bronze, it would melt it in an instant as if it were wax. If it landed on a frozen lake, it would make it boil in an instant. Pause here briefly, my soul, and answer a few questions I will put. First, I ask you: If a special furnace were fired up as was customarily done to torment the holy martyrs, and then men placed before you all kinds of good things that the human heart might want, and added the offer of a prosperous kingdom - if all this were promised you on condition that for just a half-hour you enclose yourself within the furnace, what would you choose? Second, I ask you: If you already had possession of a great kingdom and were swimming in a sea of wealth so that nothing was wanting to you, and then you were attacked by an enemy, were imprisoned and put in chains and obliged to either renounce your kingdom or else spend a half-hour in a hot furnace, what would you choose? "Ah!" you would say, "I would prefer to spend my whole life in extreme poverty and submit to any other hardship and misfortune, then suffer such great torment!" Now turn your thoughts from the temporal to the eternal. To avoid the torment of a hot furnace, which would last but a half-hour, you would forgo all your property, even things you are most fond of, you would suffer any other temporal loss, however burdensome. Then why do you not think the same way when you are dealing with eternal torments? God threatens you not just with a half-hour in a furnace, but with a prison of eternal fire. To escape it, should you not forgo whatever He has forbidden, no matter how pleasant it can be for you, and gladly embrace whatever He commands, even if it be extremely unpleasant? Eternity never ends. This is the truth that has made even the greatest saints tremble. The final judgement will come, the world will be destroyed, the earth will swallow up those who are damned, and they will be cast into hell. Then, with his almighty hand, God will shut them up in that most unhappy prison. From then on, as many years will pass there are leaves on the trees and plants on all the earth, as many thousands of years as there are drops of water in all seas and rivers, as many thousands of years as there are atoms in the air, as there are grains of sand on all the shores of all seas. ETERNITY NEVER ENDS. THIS IS THE TRUTH THAT HAS MADE EVEN THE GREATEST SAINTS TREMBLE. After the passage of this countless number of years, what will eternity be? Up to then there will not even have been a hundredth part of it, nor a thousandth - nothing. It then begins again and will last as long again, even after this has been repeated a thousand times, and a thousand million times again. And then, after so long a period, not even a half will have passed, not even a hundredth part nor a thousandth, not even any part of eternity. For all this time there is no interruption in the burnings of those who are damned, and it begins all over again. Suppose that, in the case of unhappy Cain, weeping in hell, he shed in every thousand years just one tear. Now, O my soul, recollect your thoughts and suppose this case: For six thousand years at least Cain has been in hell and shed only six tears, which God miraculously preserves. How many years would pass for his tears to fill all the valleys of the earth and flood all the cities and towns and villages and cover all the mountains so as to flood the whole earth? We understand the distance from the earth to the sun is thirty-four million leagues. How many years would be necessary for Cain's tears to fill that immense space? From the earth to the firmanent is, let us suppose, a distance of a hundred and sixty million leagues. O God! What number of years might one imagine to be sufficient to fill with these tears this immense space? And yet - O truth so incomprehensible -be sure of it as that God cannot lie - a time will arrive in which these tears of Cain would be sufficient to flood the world, to reach even the sun, to touch the firmanent, and fill all the space between earth and the highest heaven. But that is not all. If God dried up all those tears to the last drop and Cain begain again to weep, he would again fill the same entire space with them and fill it a thousand times and a million times in succession, and after all those countless years, not even half of eternity would have passed, not even a fraction. After all that time burning in hell. Cain's sufferings will be just beginning. This eternity is also without relief. It would indeed be a small consolation and of little benefit for the condemned persons to be able to receive a brief respite once every thousnd years. Picture in hell a space where there are three reprobates. The first is plunged in a lake of sulphuric fire, the second is chained to a large rock and is being tormented by two devils, one of whom continually pours molten lead down his throat while the other spills it all over his body, covering him from head to foot. The third reprobate is being tortured by two serpents, one of which wraps around the man's body and cruelly gnaws on it, while the other enters within the body and attacks the heart. Suppose God moves to pity and grants a short respite. The first man, after the passage of a thousand years is drawn from the lake and receives the relief of a drink of cool water, and at the end of an hour is cast again into the lake. The second, after a thousand years, is released from his place and allowed to rest, but after an hour is again returned to the same torment. The third, after a thousand years, is delivered fromt the serpents; but after an hour of relief, is again abused and tormented by them. Ah, how little this consolation would be - to suffer a thousand years and to rest only one hour. Now I understand in part, O my God, what hell is. It is a place of extreme pain, of extreme despair. It is where I deserve to be for my sins, where I would have been confined for some years already if your immense mercy had not delivered me. I will keep repeating a thousand times: The Heart of Jesus has loved me, or else I would now be in hell! The mercy of Jesus has pitied me; for otherwise I would be in hell! The Blood of Jesus has reconciled me withthe heavenly Father, or my dwelling place would be hell. This shall be the hymn that I want to sing to Thee, my God, for all eternity. Yes, from now on my intention is to repeat these words as many times as there are moments that have passed since that unhappy hour in whch I first offended You. What has been my gratitude to God for his kind mecy that He showed me? He delivered me from hell. O, immense charity? O, infinite goodness! After a benefit so great, should I not have given Him my whole heart and loved Him with the love of the most ardent Seraphim? Should I not have directed all my actions to Him, and in everything sought only his divine pleasure, accepting all contradictions with joy, in order to return to Him my love? Could I do less than that after a kindness that was so great? And yet, what is it that I have done? Oh, ingratitude worthy of another hell! I cast You aside, O my God! I reacted to your mercy by committing new sins and I repent with my whole heart. Ah, would that I could shed a sea of tears for such outrageous ingratitude! O Jesus, have mercy on me; for I now resolve to rather suffer a thousand deaths than offend you again. printed with ecclesiastical permission.